New Australian government statistics show that, for the first time since 2009, there has been an overall increase in the country’s international student enrolment. There were 526,932 international student enrolments in 2013, marking a 2.6% increase over 2012. The 2.6% growth rate compares to an average 5.9% growth rate over the past ten years – but also represents a distinct reversal of the enrolment declines registered in 2010, 2011, and 2012. Moreover, international student commencements jumped by 9.3% on average across all sectors; all sectors grew except for Vocational Education and Training (VET), which essentially did not change from 2012 (it dropped by 0.1%). The 9.3% growth, furthermore, compares with an average commencement growth rate among international students of 5.4% over the past ten years, suggesting a strengthening base for further growth for Australia going forward. The overall growth for 2013 is consistent with the year-to-date trends for Australia that we first reported in October 2013. In terms of source countries, four of the top five markets – China, South Korea, Vietnam, and Thailand – are sending more students than in 2012. India, the second-most important source country overall after China, posted an 8.6% decline for the year after a modest (1.85%) year-over-year increase in commencements. All told, these top five markets are responsible for over half of Australia’s international student enrolments (52.1%). Higher education comprises the largest volume of both international student enrolments (43.9%) and commencements (31.6%) for 2013. International enrolments in higher education grew slightly by 0.4% over 2012, and commencements more substantially by 8.1% over 2012. China is by far the lead source country for higher education (39.9%), with India far back in second place at 7.2%. Post-graduate studies are currently a greater growth area than undergraduate studies for international enrolments in Australia. Bachelor-level commencements declined by 3.5% in 2013, compared to growth of 19.4% for post-graduate commencements in the same period. The big winner in terms of growth is the ELICOS (English-language) sector, which experienced 21% growth in new commencements (for a total of 91,405 commencements) – and this even though the data does not capture students pursuing language studies while in Australia on tourist or working holiday visas. This represents 15,843 more commencing students than 2012 and is not only growth compared with 2012, but also compared with both 2011 and 2010. The ELICOS growth pattern had been ongoing for 16 months through the end of 2013 and in fact was gathering strength throughout the year, with the first half of the year showing growth of 14% and the second half of the year showing growth of 27%. Again, China emerges as the most important source country: it is responsible for 25% of international enrolments and 23.8% of commencements in the Australian ELICOS sector. Brazil is next with 8.7% of enrolments and 9.1% of commencements, followed by Thailand (7.9% enrolments, 8.0% of commencements). Interestingly, more than 90% of Chinese ELICOS students in 2012 went on to further studies in Australia compared to less than a third of those from Brazil and roughly half from Thailand. In both 2010 and 2011 all of the top ten source countries for ELICOS experienced declining numbers. In 2012, four were still in decline: China, South Korea, Brazil and Saudi Arabia. Now, all top ten countries have returned to growth. The next-most important international education sector in Australia, by volume at least, is not enjoying the same upswing as the other sectors. Responsible for 25.6% of total enrolments and 27.7% of total commencements, VET enrolments fell by 6.4% in 2013 and commencements by 0.1% in 2013. In VET, India emerges as the most important source country, responsible for 21.5% of enrolments and 17.6% of commencements. 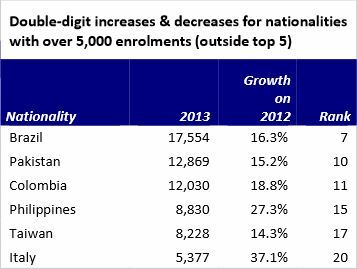 China is next with 10.5% enrolments, followed by the Republic of Korea and Thailand (7.3% and 6.6% respectively). In a recent ICEF Monitor article, Claire Field, Chief Executive Officer of the Australian Council for Private Education and Training (ACPET), made a point of underlining the importance of the VET sector in Australia. But as far back as July of 2013, we wrote about the data emerging then about the sector continuing to experience declines, in large part because of what many see as its exclusion from visa and immigration reforms in Australia. The 6.4% international student enrolment drop this year in VET follows a decline of 50% from 2009-2012. This entry was posted in Australia, Australia/Oceania, Higher Education, Language Learning, Most Popular, Regions, Research, Vocational and tagged secondary schools for international students, tertiary education overseas, study abroad, primary schools abroad, postgraduate student recruitment.